for the REALLY,REALLY CHEAP Illusionist! 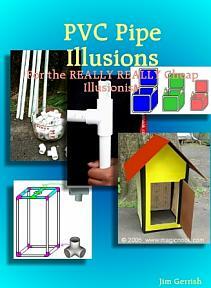 Build-It-Yourself at a cost of $5 - $20 bucks per Illusion! A small three-fold screen is assembled in full view of the audience, with a handheld electric light keeping everything well lit. The light is lowered into the triangle formed by the screens and a shadow begins to grow until it becomes the shadow of your assistant, who bursts or steps out of the screens at the finish. A tiny clown doll is put into the little empty dollhouse, and it gets bigger... and bigger... and finally turns into a real live clown. / An empty box is assembled on stage, complete with self-tying ribbon. When opened, it is filled with toys and gifts AND your beautiful assistant. Two versions are given for this versatile illusion, a hand-held version and a self-contained cabinet version. The Illusionist or an assistant can be made to appear or disappear, or several people can be produced one after the other. Need a backstage changing room? Step into the cabinet! It really is a Utility Cabinet! It's made of PVC pipe, so it can't carry heavy loads, but it operates on the Tip-Over principle so you can show it empty again and again and still produce one or more people, plus a whole lot more. It's an Illusion by itself, but as a stage setting, it can be used in combination with many other Illusions. A picket style fence stretches across the back of the stage. In the center is a garden archway (the gate is optional). The Illusionist produces two people (no boxes! ), and then turns himself into his own mother-in-law (or whomever) and reappears at the back of the audience. It's made of PVC pipe, so don't use this as a cage for a real wild animal, but it's just the thing to make your pussycat costumed assistant appear center stage in an eyewink. We give you two versions; one for stage and one for performing surrounded. The effect is the same: in an empty archway lit by rope lights, the Illusionist or his assistant can appear or disappear in an (optional) puff of smoke. Your petite assistant is secured in an enormous stocks contraption- head, hands, and feet... all real appendages and constantly wiggling. Her arms and legs are stretched out five feet or so from her body and her head is pushed down to the floor. At the end, the lightweight Illusion is lifted up and off her, and she is back to normal. A member of the audience (or your assistant) is tied to the stake and simulated flames on a waving banner are brought closer and closer. Suddenly the victim is freed although the ropes are still tied as tightly as before. Set up your own portable stage anywhere... outdoors, in a gymnasium, circus arena, or convention hall floor. With the audience sitting in front and outside, it is a stage, but bring a small audience onto the stage for close-up work and it serves as a tent. It can also have its own private dressing room attached. We thrown in as a bonus plans for making stage flats and backdrop screens that change colors. Many Illusions (like the Archway) are enhanced with flashes of fire and puffs of smoke. Build your own battery operated electric flashpot from PVC pipe. Can also be converted into a confetti cannon.. Complete Version of Book 1 - All 11 Construction plans, secrets of each Illusion, tips on performing all of the Illusions: $40.00 - The information will be e-mailed as a pdf file once payment has been made. There are NO refunds on magical secrets. Once you learn the secret, you cannot unlearn it, so you can't request a refund. If you wish to remain ignorant of the secrets, don't buy the plans at all. The 3 books can also be shipped to you on a CD-ROM instead of being e-mailed. You will need to give us a shipping address if you choose this option. NEW! Book 4! Even MORE PVC Pipe and Dollar Store Illusions! PVC Pipe Illusions- in Print! This book, which includes PVC Pipe Illusions Book One, Two and Three, is now available as a fully printed paperback from Lulu.com: 265 pages, 8.5" x 11", perfect binding, full-color interior ink - $100.00 plus shipping.